The Serbian president-elect and Prime Minister Aleksandar Vucic declared today that the Balkan nation has no plans to join the NATO alliance, as many of its former Yugoslavian nations have. Serbia is a long-time ally of Russia and was not expected to join the Western defense bloc. “I have attended the NATO summit and told everyone that we had no intentions (to join NATO),” Vucic said. “We seek to remain militarily neutral and refrain from joining military blocs,” he added. According to the Serbian prime minister, this was the reason why the country was investing in its security. The Serbian army and police have received new uniforms, nine new helicopters have been delivered to the country, while Russian MiG aircraft are expected to arrive within 60 days, Vucic said. At the same time, he emphasized the importance of the “European way” for Serbia, reported Russian state news agency TASS. 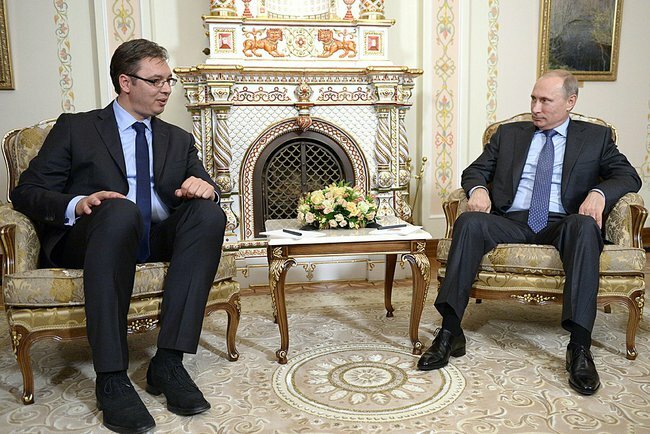 “This is not about sitting on two chairs.” “Seselj has chosen a chair on one side, while I choose the one in the middle, which is the Serbian chair, and I don’t want to choose another,” replied Vucic to an opposition figure questioning his riding the fence on the issue. Vucic stated that joining NATO would split Serbian society as an overwhelming majority oppose such a move. Russia is proving weapons to the former communist territory, including anti-aircraft systems, jet fighters, armored vehicles including tanks, and other equipment.